Peace UMC supportes the Family Thrift Shop with items to sell and volunteers. The thrift store not only provides needed items to families on a tight budget, they also provide needed clothing and outer garments to guests at the Lydia’s House emergency shelter. Peace partners and participates in the Youth Initiative program. It’s a mentorship program designed to help a young person from the Richland Middle School and their entire family. The youth and their family are paired with another family who have a stable, firm, and grounded understanding of what it takes to raise a family, juggle the stress of everyday life, have strong communication skills and are committed to a local church. The goal is to create stronger family units that can strengthen the community. For more information visit THIS website. 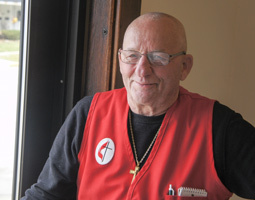 The Red Vesters is a hospitality ministry of Peace United Methodist Church. When you walk into Peace you won’t miss the Red Vesters and their welcoming and uplifting attitudes. They can help newcomers find their way around, open doors, and are available to serve you however needed. It is a great ministry for people with the gift of hospitality!